'Tis the season! Starbucks is rewarding its loyal customers again with a BOGO!! 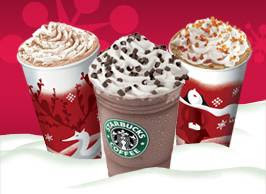 Starting today, November 17, Starbucks is offering a buy one, get one free on the holiday drinks between the hours of 2 and 5 pm. You know you're craving a peppermint mocha. Who doesn't love a good BOGO?? Block out some time to stop by today.